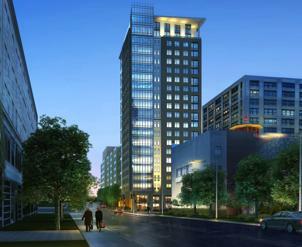 Architect rendering of the project by ADD Inc.
Construction has begun on One Greenway, a 362-unit mixed-income development that borders Boston’s Chinatown and the Rose Fitzgerald Kennedy Greenway, the project’s developers said. The developers are New Boston Fund Inc., a private equity real estate investment, development, and management firm, and Asian Community Development Corp., a nonprofit group that serves Greater Boston’s Asian-American community. The developers hope the two-building project at the corner of Hudson and Kneeland streets will act as the southern gateway to the Greenway. According to the website of the Greenway’s conservancy, the Greenway is a “ribbon of contemporary parks’’ that stretch from the North End to a few blocks of South Station. Construction for the North Building is slated to be complete in the summer of 2015. Suffolk Construction is the general contractor and ADD Inc. is the architect.